Auntie's Puzzle is an easy five patch quilt block (meaning that it is designed on a 5 x 5 grid), but I prefer to construct this block as an uneven nine patch. I just seem to have an aversion to sewing blocks in rows, rather than chunks, but do not let my opinion sway you. It is perfectly fine to sew it in rows if you are more comfortable with that. The instructions include measurements for 4 different sizes of the quilt block. The two sample quilts illustrated look very different from each other. The directional nature of the block shows in the quilt on the left. It is set with blocks side by side, using 90 degree rotations of the block to create a secondary pattern. 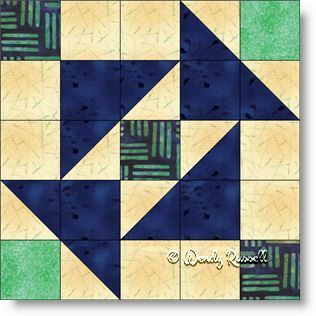 The quilt blocks set on point have additional blank blocks and setting triangles to showcase your quilting skills. Enjoy your creating experience!